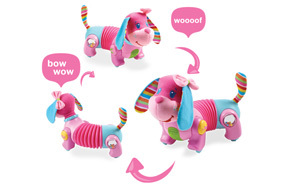 This Tiny Love Follow Me Fiona baby activated electronic dog is the ideal crawling companion. She has an accordion-shaped body that can be set to move in a straight line as well as in a circular motion so she can encourage your little one to get on the move. She also has speed control, mirror with beads, hologram and bright buttons to activate noises. Before baby begins to crawl, place Follow Me Fiona in circular mode. Alternate between clockwise and counterclockwise. 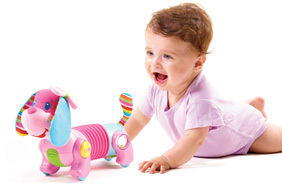 Place the toy in front of your baby on the floor and touch it to trigger its movement.